The Formentera Council has convened a one-off plenary assembly this Thursday to discuss the granting of a works contract for a live-in dependent care centre. Islanders have long called for such a residence, the crowning piece in a matrix of essential services Formentera began building 11 years ago with the island's hospital. The future assisted-living centre will make it possible for aged islanders to grow old with dignity here on Formentera. Upgrades on avinguda Joan Castelló i Guasch in Sant Ferran will mark the culmination of neighbour-approved plans to reform the town that began with the overhaul of two roads, or carrers, Guillem de Montgrí and València. The reforms, conceived as a way to soothe traffic on the arterial and give right of way to islanders travelling on foot and bicycle, will mean more space for pedestrians, a new cycling lane and new recharge points/parking spaces for electric vehicles. This expansion of the island's dependent care centre, known locally as the Centre de Dia, or “Day Centre”, will entail construction of a residential area for dependent persons. There will be capacity for 14 single and two double rooms, for a total of 18 people. The new structure will house a reception area, visitor services, a dining hall, living room and areas for nursing staff, medical exams and storage. The structure will be made with provisions in place should further expansion be necessary in the future. 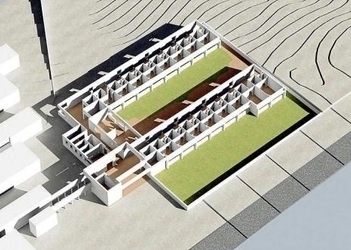 The 16-month, €2.4-million project, fruit of a deal between the Formentera Council and the social welfare ministry of the Balearic administration, will give rise to a built space totalling over 1,169 square metres. Work on Sant Ferran's avinguda Joan Castelló i Guasch will include improved paved surfaces and undergrounded utilities like sanitation, drinking water, telephone lines, electricity and public street lights. The proposal also covers expansion of pedestrian spaces and would mean eliminating architectural barriers and incorporating a dedicated bike lane the entire length of the road. Recharge points along the road are envisioned as well. Engineers of the project, which is a continuation of the improvements on Guillem de Montgrí and València, are hoping for the same “single surface solution” (i.e. the pavement and road surface are of uniform height) as the one used for that revamp. The six-month deadline is intended to ensure completion in time for the 2019 tourist season.